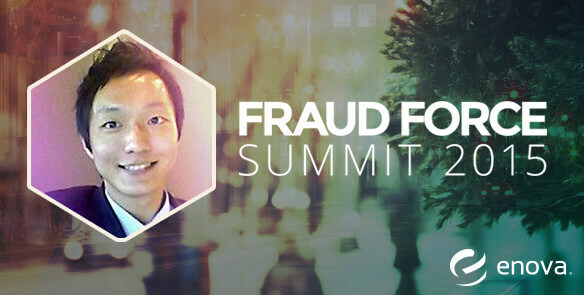 Fraud Force Summit Recap - Enova International, Inc. The Enova fraud team was in Portland, OR this week for the 2015 iovation Fraud Summit, “Gain the Edge.” It was a great experience for several reasons and our team took a lot away from it. First, we had the chance to meet and hear best practices from professionals currently using iovation to prevent fraud. Many shared their experiences in reducing losses by setting up more rules and submitting more evidences to the iovation system. The CEO of iovation, Gregg Pierson, mentioned a couple of very creative usages of iovation to manage fraud risks while reducing conflicts in user experiences: tracking devices for an account, looking at browser version regression and alerting if multiple time zones in a short period of time, all of which we are excited to test out. In addition, it was a great opportunity to learn about the types of projects iovation had been working on. One project I was particularly impressed with was iovation’s new methods to figure out real IP addresses. The company had been using Adobe Flash as a means to identify real IP addresses but many websites had started using the open standard HTML5 due to the proprietary nature and well-documented vulnerabilities associated with Adobe Flash. iovation had worked hard to come up with a few alternatives to identify real IP addresses even when Adobe Flash was absent; subsequently, it was able to maintain the detection rate significantly consistent even when the use of Adobe Flash had notably decreased. The entire team enjoyed the summit, but I may have enjoyed it more than anyone since it was my first major presentation outside Enova. Chief Analytics Officer, Joe DeCosmo, and I presented together on how we combine analytics and operations to fight back the bad guys. We shared the feedback idea where analytics and operations collaborate to expedite the loop of detection, analysis and implementation. We also talked about Almond, the new tool internally developed to facilitate finding fraudulent patterns on a massive scale, which was generally very well received. I was a bit nervous in the beginning but happy that I managed through well to the end. Overall, the summit was an excellent opportunity for us to learn how risk managers and analysts have been working on the same battle line, and to share our expertise in return.